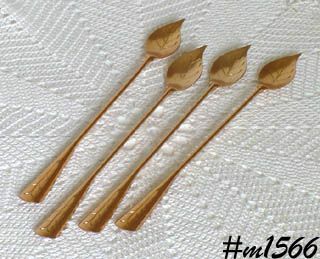 This listing has very pretty, colorful aluminum iced tea spoons! These are called Tall Stirs (tallstirs) and there are 4 in this listing. All are shiny gold color and measure 7 3/4" long (end to end). The bowl is shaped like a leaf and has pretty "stem type design with same stem design on handle.